Dante Beatrix offers an irresistible line of toddler backpacks, so cute I honestly cannot tell you which one is my favorite as I want them all! 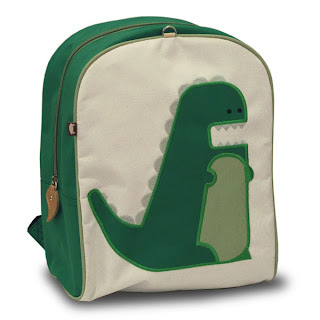 After much debate I settled on the Dino backpack for Connor though it was a hard toss up between the dino, shark or bear. For a kid/toddler sized backpack its actually very roomy and makes for a great day trip bag as well as a second diaper bag and its actually seen almost daily use since it arrived. We use it to tote toys to the grandparents house, as a day bag for when Connor goes to his aunt for "daycare" and as an activity bag when we are around town. Everywhere we go someone asks about his adorable backpack and wants to know where to get one! I mean can you blame them? Easy to clean and VERY well made Dante Beatrix's backpacks certainly beat the socks off of anything you can buy at those department stores! Very reasonably priced at $36, I'm highly considering getting Connor a second backpack so we can load one up as a spare diaper bag and one up with his travel goods. You can purchase one directly from Dante Beatrix on their web page or you can search for a store near you!